Amy graduated from Northeastern University in 2006 with her Masters in Physical Therapy and has been practicing for over 10 years in Boston, Qatar, and United Arab Emirates. She is a board certified Sports Physical Therapist by the American Physical Therapy Association and a certified strength & conditioning specialist by the National Strength & Conditioning Association. Amy recently completed her clinical Doctorate in Physical Therapy from Northeastern University in 2014. Prior to joining PT360, she worked at Aspetar Orthopaedic and Sports Medicine Centre in Qatar, International Knee and Joint Centre in Abu Dhabi, and Kennedy Brothers Physical Therapy in Boston, where she focused on sports and orthopedic injuries. She has worked extensively with athletes of all levels both in the clinic and on the field, with an emphasis on treating marathon runners, triathletes, soccer players, and complex knee injuries both pre- and post-operatively. 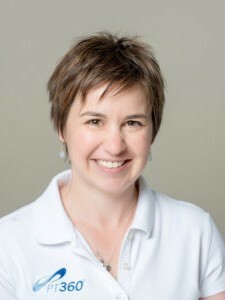 Amy takes an integrative and evidence based approach to rehabilitation, incorporating strength and conditioning, manual therapy, biomechanics, health and wellness concepts and nutrition to create individualized programs for each patient. Amy is an avid athlete herself, having participated in a number of competitive and recreational sports over the years including, soccer, track and field, downhill mountain bike racing, snowboarding, running and yoga. Amy enjoys spending time outdoors with her husband Joey and young daughter, Zoey.